Last weekend the team were treated with a series of performances by groups of dedicated re-enactors, for the annual Ribchester Roman Festival. 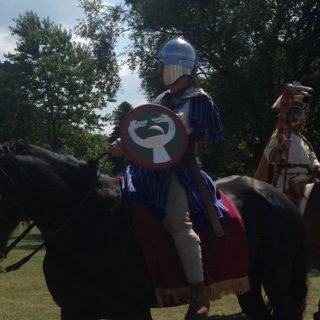 This was a wonderful opportunity to see the Roman cavalry and infantry in action, who entertained the crowd with impressive displays of horsemanship and military prowess. 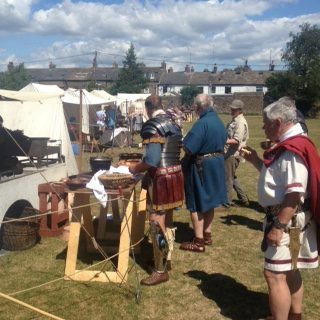 Despite the continuing heat, genuine Romans were dressed to the nines and smiling as they talked about their lives and work, explaining their fascinating displays and wares. A couple of Roman matrons sported incredible hairstyles following the fashions of the imperial court and explained Roman beauty secrets. Did you know that crushed butterfly wings make a dazzling green eyeshadow, chalk applied to the skin creates that desirable pale tone and the heady sweat of gladiators is a potent aphrodisiac? We found the offer of free sausages more tempting than these tips to be honest, but the students learned a lot about the Roman experience and aspects of material culture. 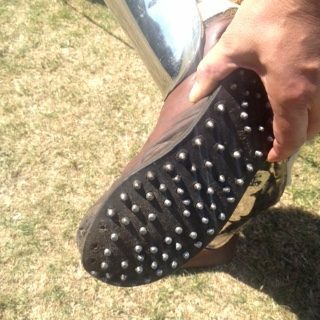 We examined the soles of various replica hobnailed boots to better see how many nails might occur in one shoe – to the dismay of a few of the team, it was definitely a lot! The number of shoes we’ve been finding this year is growing steadily, which means a lot of extra work in finds processing. It also slows down the pace of excavation as we carefully plan and record each individual nail. But joking aside, we are really excited about our hobnail finds as excavating and recording hobnailed shoes in a drier context like ours doesn’t often happen on a dig; with the leather sole gone, the tiny hobnails left are easy to miss, so our painstaking work here will aid research into this important element of design history. 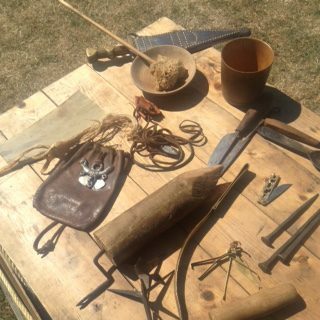 Many stalls had replica objects based upon real items found in various museums across Europe, including a stall showcasing the kit of a Roman legionary. 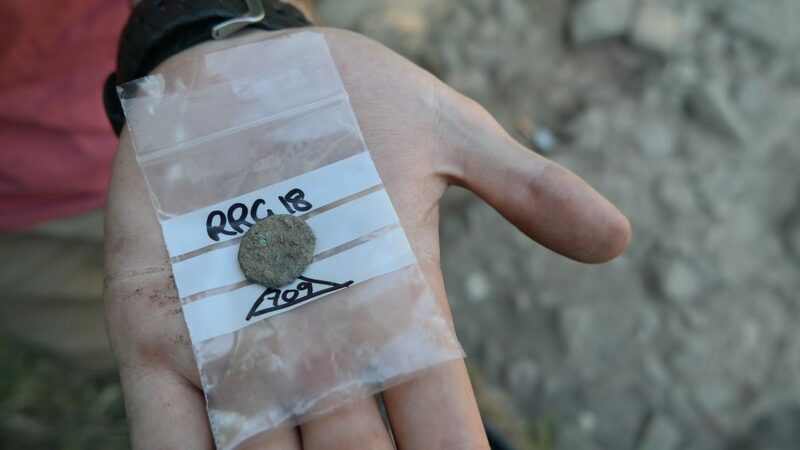 The assemblage of objects included repair tools, writing implements, camping kit and things for gaming and gambling – these are the sort of things we’re looking out for while we excavate, as they paint a picture of the social life of the soldiers stationed here at Ribchester. Incidentally, they’re also the kind of objects our team of archaeologists possess. 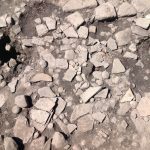 Life on an excavation is in many ways similar to the life of the legionary and sometimes we really do feel that we are walking in their shoes. The Romans were very fond of gambling and we were encouraged to cheer our support for our favoured horses during the cavalry displays. The riders used leather saddles reconstructed from examples found at Vindolanda on Hadrian’s Wall which have no stirrups; they re-enacted various cavalry moves like team formations and shooting arrows at a target, demonstrating the balance and skill required by such soldiers. We also ran a booth at the festival to promote our work and answer questions, encouraging visitors to come see the excavations which they did in big numbers. 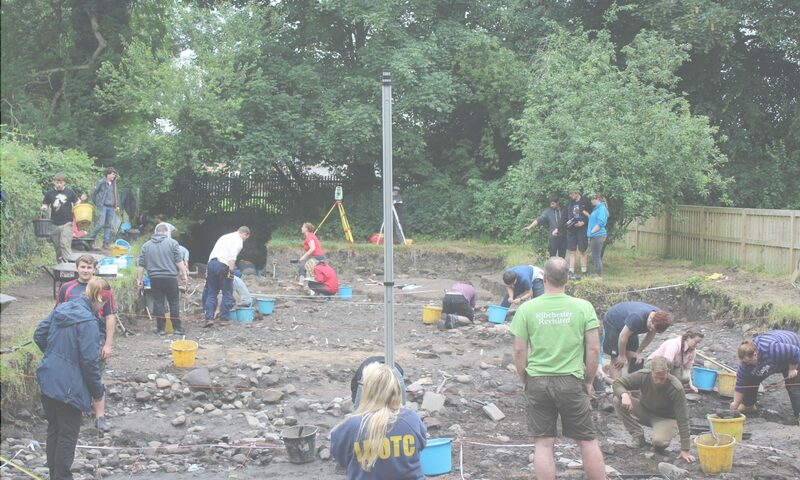 We’ve also been featured on the local radio and news since the festival so we’re happy to see more people responding to our finds and visiting to find out more. We have an Open Day on Saturday 14th July with a tour of the site by our lovely director Ash and a talk about the project this year. 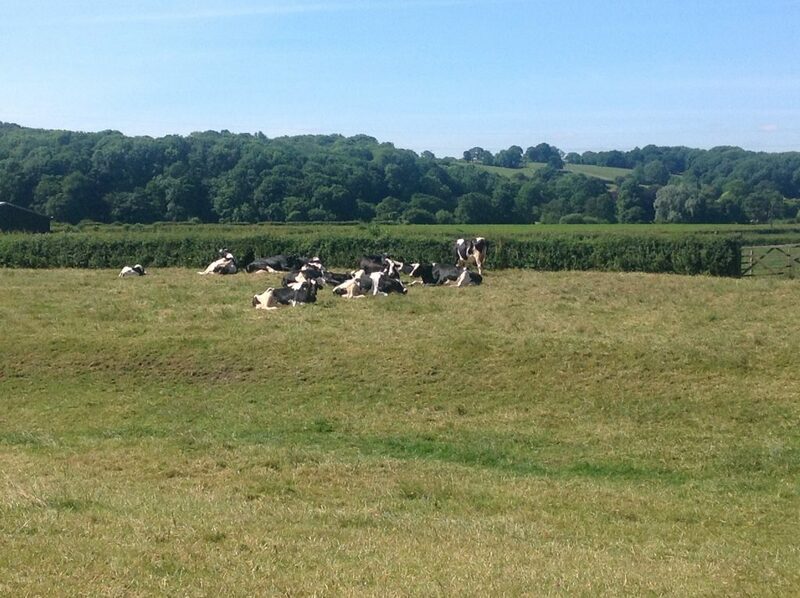 Be sure to come to take a look before our season ends on Sunday 15th July! It’s Coming Home! Halfway through the 2018 season! Halfway through the 2018 season! 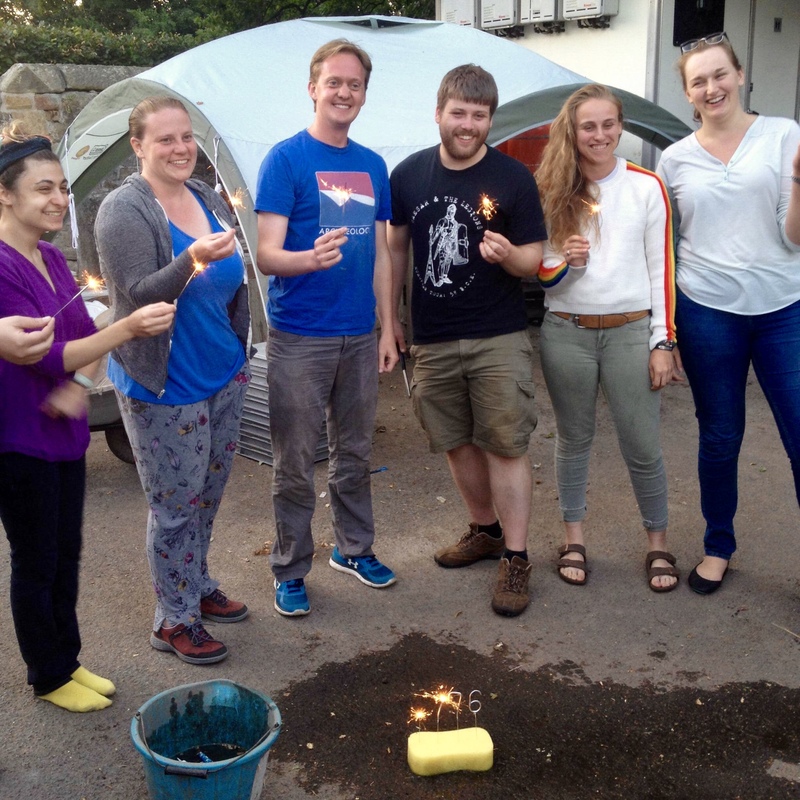 Our American students and volunteers celebrating the 4th of July with our make do 'fireworks'. Moving into our working week, the archaeologists routine was jolted slightly by a change in the daily schedule, thanks to the British weather’s continual attempts to melt the usually chilly north-west. Starting now at 8:45am, a few tired grumbles could be heard around the breakfast tables, plus a couple of late starters who forgot to change their alarms. Roman Coin found in the upper northern part of the trench. 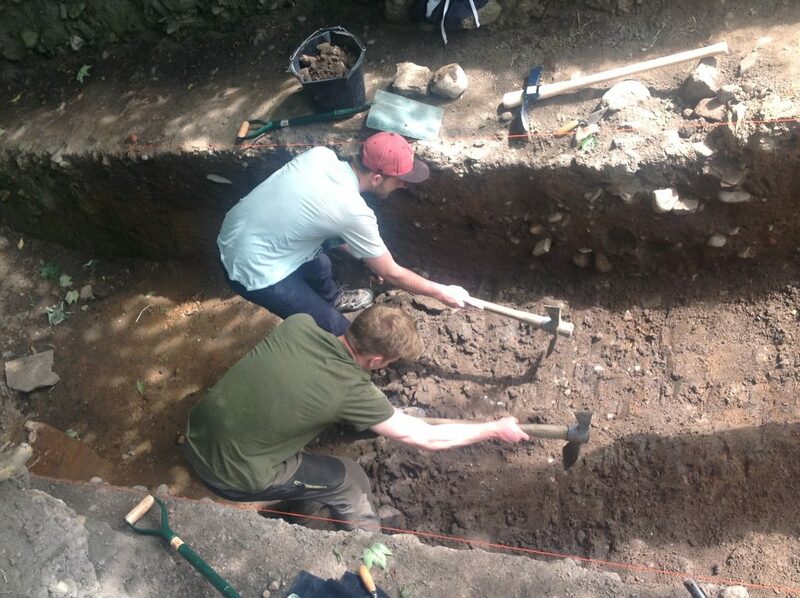 As a lucky coincidence our excavations have coincided with the 2018 FIFA world cup. In glorious style many of our British team members and their new buddies rejoiced in the victory no one saw coming! England winning against Columbia in penalties. Some of the team in the south using a dumpy level to record the height of a context. After a hard day’s work, the university excavation team retired to the River Ribble and Village Hall, and out came the evening crew. 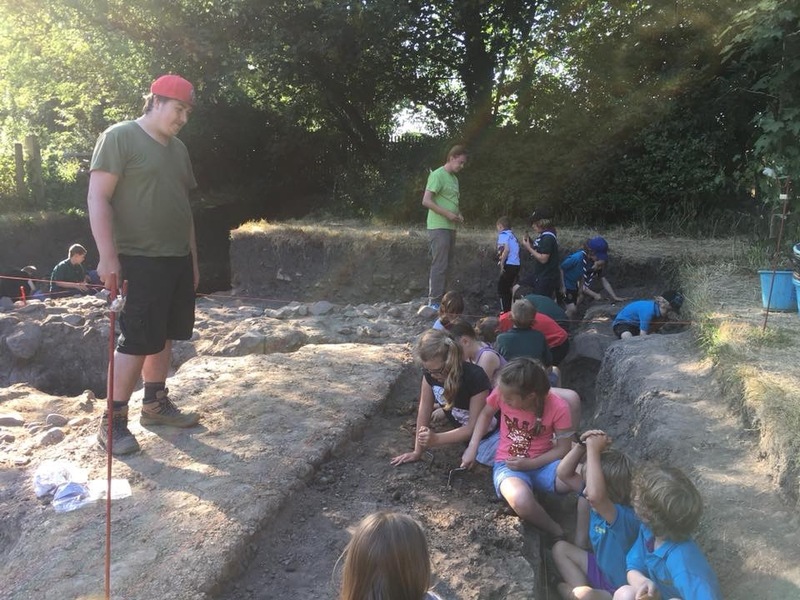 We were lucky enough to have the local Ribchester Cubs and Beavers come in and under the guidance of our experienced supervisor ‘Rusty’ AKA Adam, helped excavate the Thomas May trenches. Rusty AKA Adam helping lead the Cubs and Beavers in excavation the northern trench section. 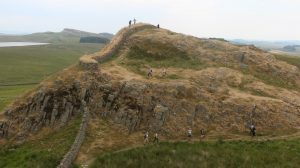 With a trip up to Hadrian’s Wall happening on Thursday, students are expanding their understanding of the archaeology of Roman Britain. 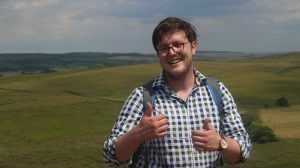 With many students doing interest-led projects for their final assessments, this will provide a good opportunity to see trends and traditions further afield than just the Bremetenacum at Ribchester. Our week three started with bang! With American 4th of July celebrations landing on a working day we decided to join in on American fun and fanfare slightly early, on the 2nd! With lessons in S’mores (yes, real Graham crackers too), ‘fireworks’, a BBQ cookout, all topped off by a rendition of Hamilton the musical, our taste of American festivities was complete. 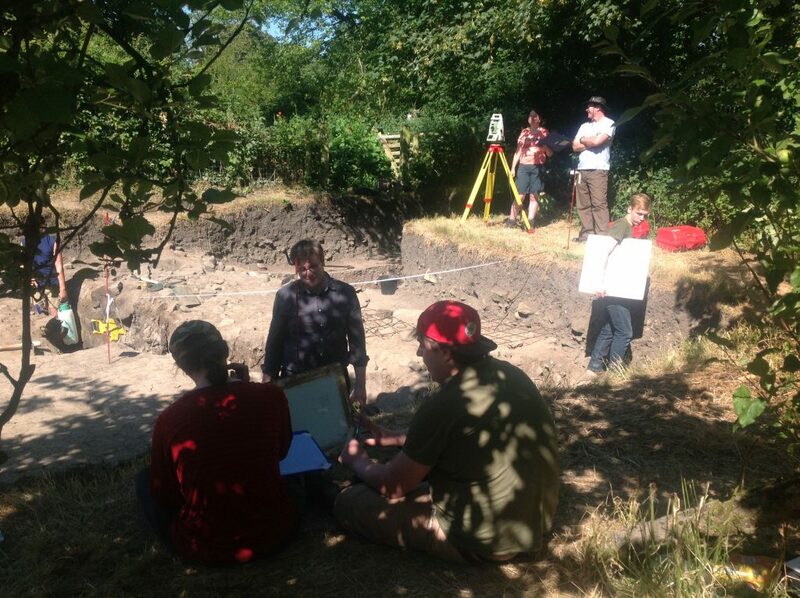 In true British style, talk of the weather has become a mainstay for the excavation team. It’s not uncommon to hear faces smeared with sunscreen and dirt, exclaim how “done” they are with the heat. 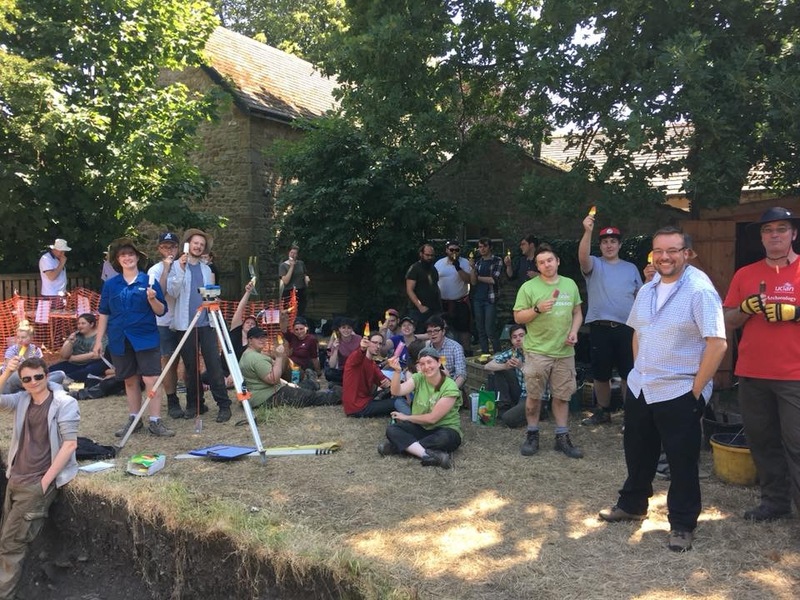 The luckiest members of the excavation team retreat to the far northern reaches of the trench (so far north its ‘off the grid’) where shady spots deep in the Roman ditches, and Victorian Trenches, are plentiful. 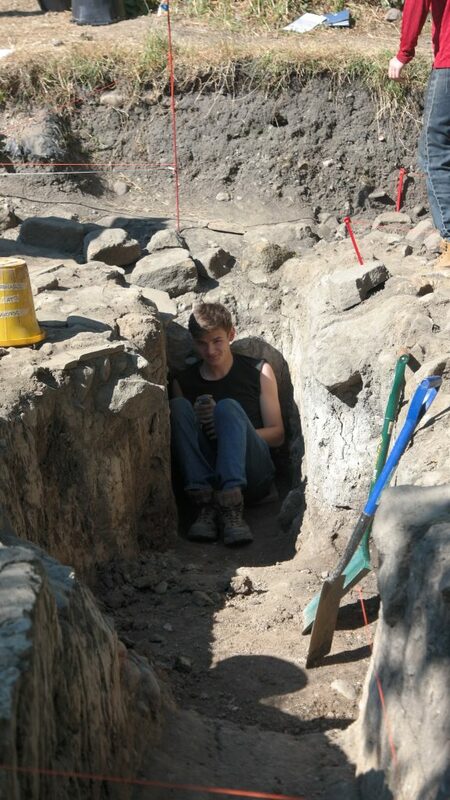 One of the student archaeologists hiding from the sun in the Victorian era trench. 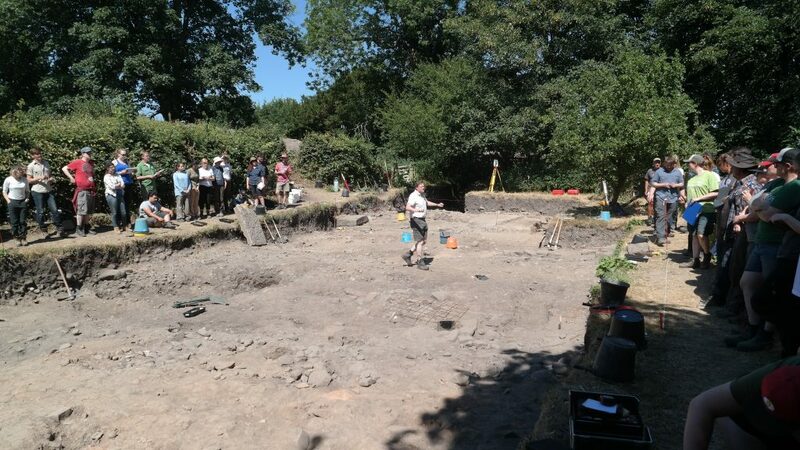 As per usual our Tuesday featured a site tour by our charismatic excavation lead Dr Duncan Sayer, who has encouraged us to continue considering the complex relationships between features and their stratigraphy throughout the whole site. 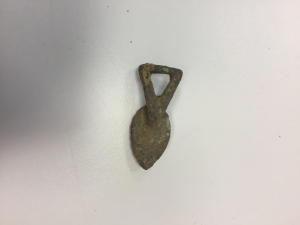 Some of the areas of interest touched upon included the ongoing finds of 100+ hobnails still in the shape of shoes, a furniture stud from a ‘well’-like feature, plus a lovely Roman coin. 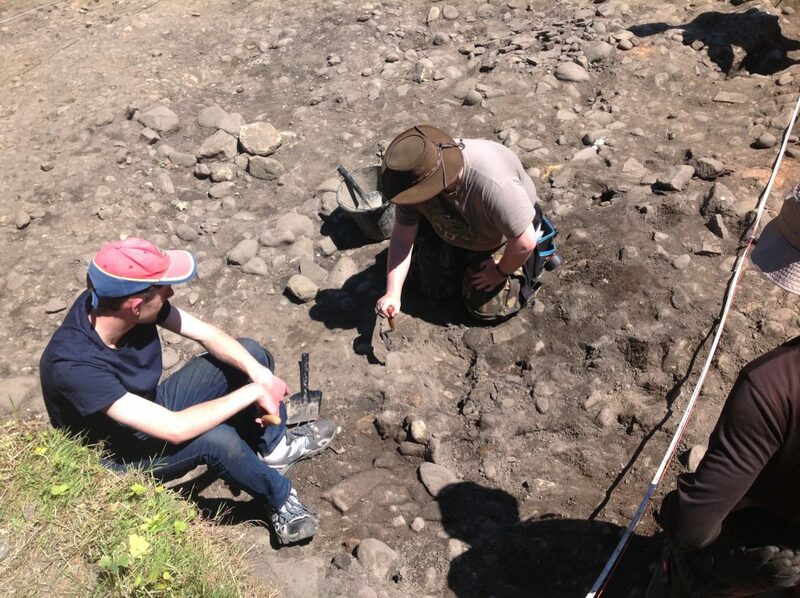 Dr Duncan Sayer providing a site tour of the northern part of the trench, where a myriad of hobnails have been found. 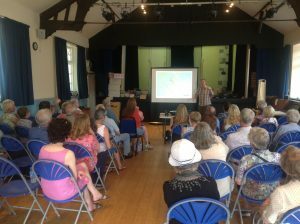 On Wednesday afternoon students were given an expert talk from Peter Webster. 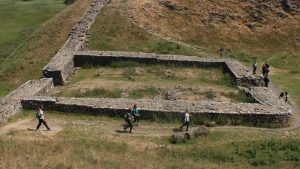 Peter excavated at Ribchester in the 1970s and shared his keen knowledge on Roman pottery and how they changed forms throughout the different stages of the Roman empire in Britain. 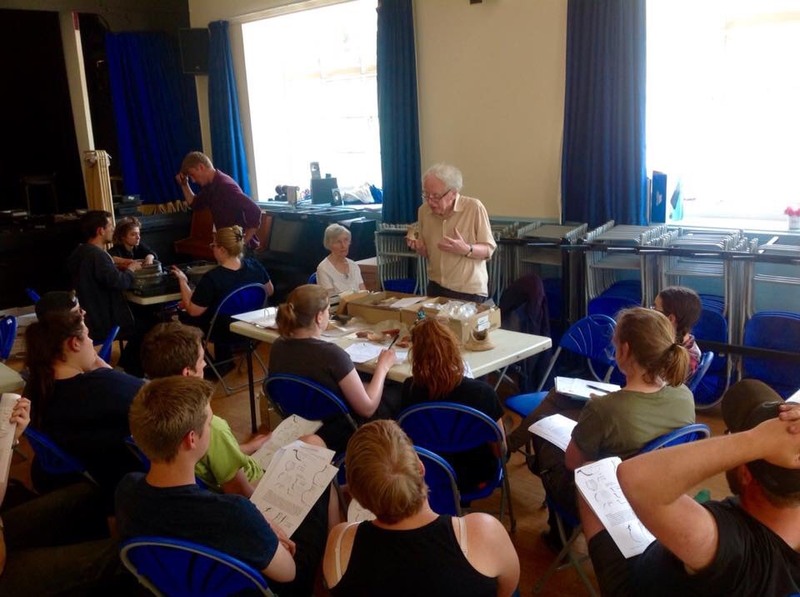 Students listening to Peter Webster explore the wide world of Roman pottery. 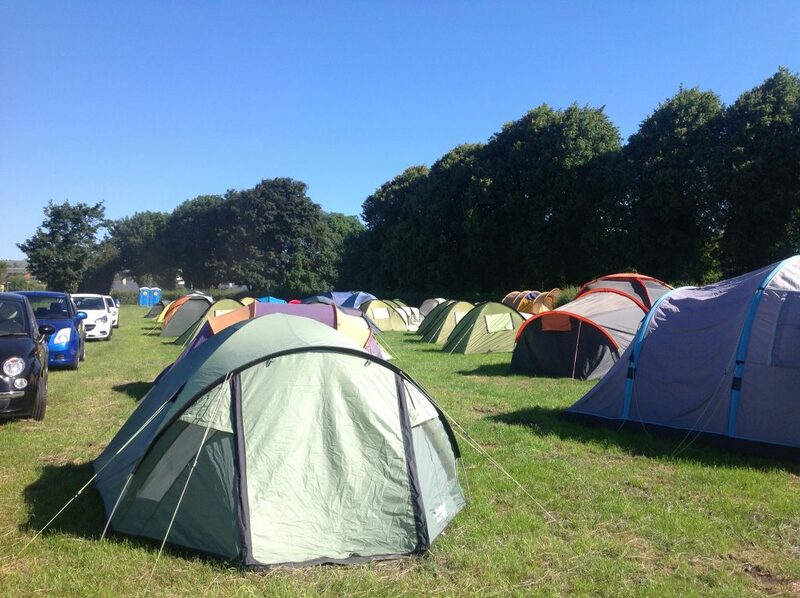 Ribchester Revisited mid-week 2, feeling hot! 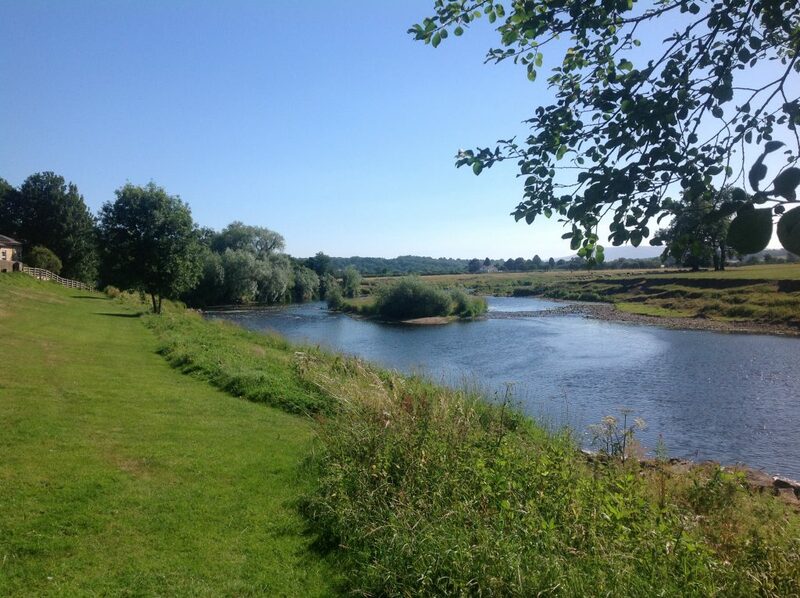 Week two at Ribchester has begun with unseasonably warm temperatures. Remember we are in Lancashire, where it is rarely this hot and all students regardless of origin are struggling with the weather. Steps were taken to beat the heat including the dispersal of ice lollies amongst the students. 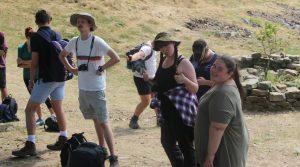 Additionally, a lecture by Don O’Mera, the sites archaeobotanist for the duration of the dig, provided a much needed respite from the oppressive heat. 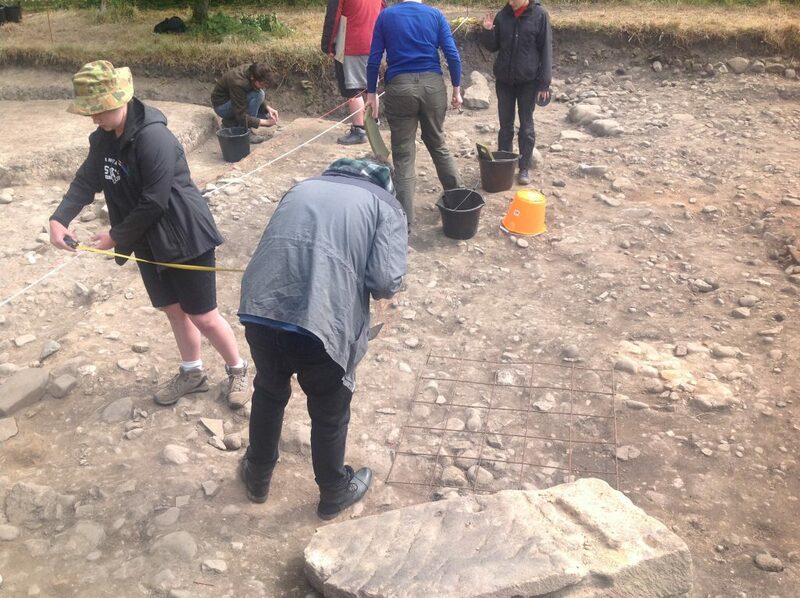 Each of the students are beginning to find their feet, developing their excavation skills and knowledge. 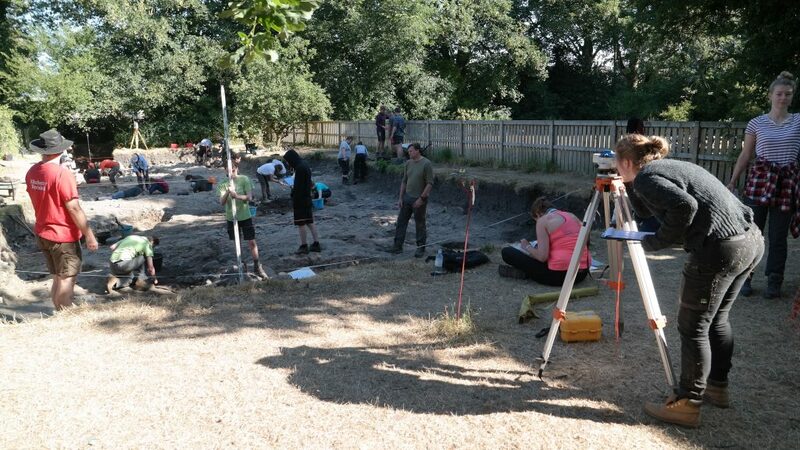 Each team can be seen working dynamically as a group, becoming faster and more confident with planning, excavating and recording finds. 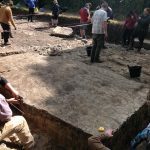 We have had 317 number of visitors who have enjoyed learning about both the site and all the students who have travelled to excavate it. 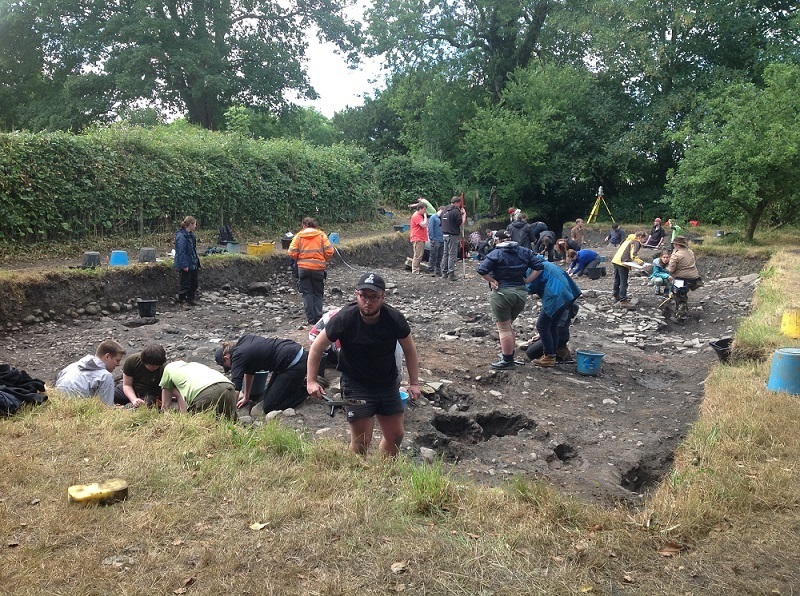 Students are beginning to ask questions about the sub-areas of the trench, including overall function of the site and purpose of individual structures. There has been a marked improvement in planning skills and context sheets are being filled with a greater degree of accuracy than before. 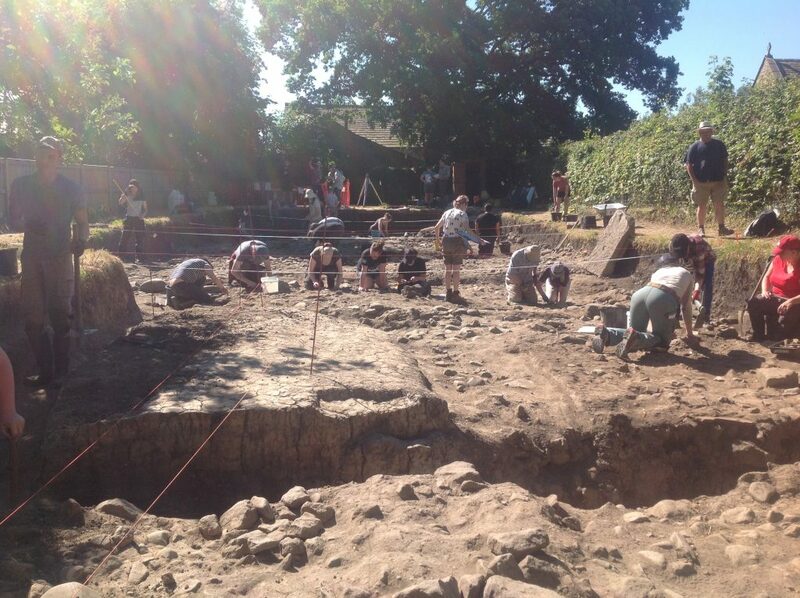 Three school groups who visited the dig on Tuesday, received tours of the granary and the excavation site from Jim. The children were very well behaved, and answered various questions, such as what did the Romans bring with them to Britain? The children visited Ribchester Museum and had lunch in the Village Hall. 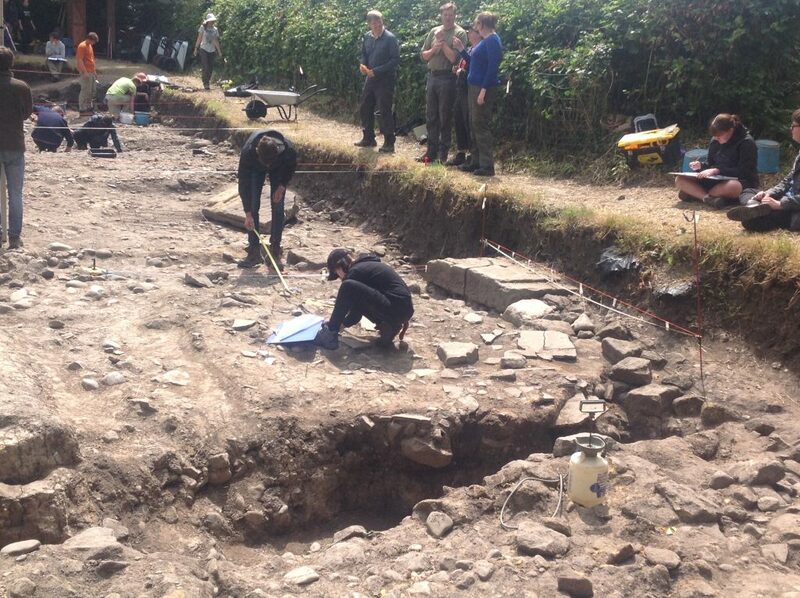 In the mid-section of the trench, further work has been done to excavate over fifty hobnails. This was an extremely significant find as these were found in the shape of a shoe. This is the clearest outline of a shoe that we have found on site so far. Each nail has been carefully excavated and recorded for further analysis. Interpretations of trench areas are changing as excavation continues. 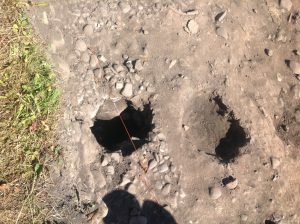 A pit in the south of the trench is thought to be a well, and a bead was found in this area. 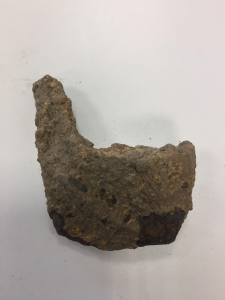 In the north of the trench, a black area of soil has been identified and we are debating whether this may be part of the remains of the earlier wooden fort. 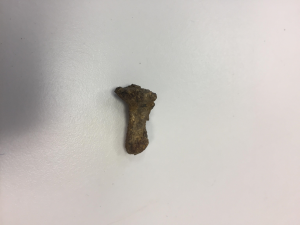 More small finds are being recovered from the guardhouse, including animal bone. 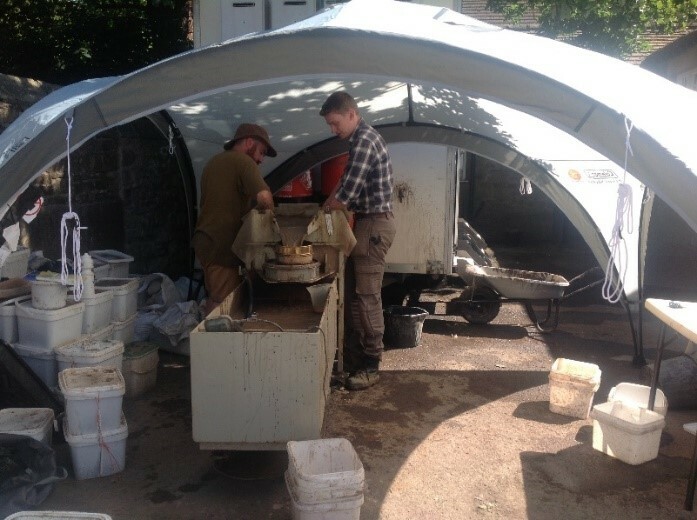 Work carries on throughout the site, despite the hot weather. 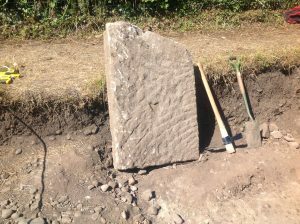 Just to remind everyone we run tours of the site between 11am and 5.30pm on Tuesdays to Sundays. Welcome back for another year at Ribchester. 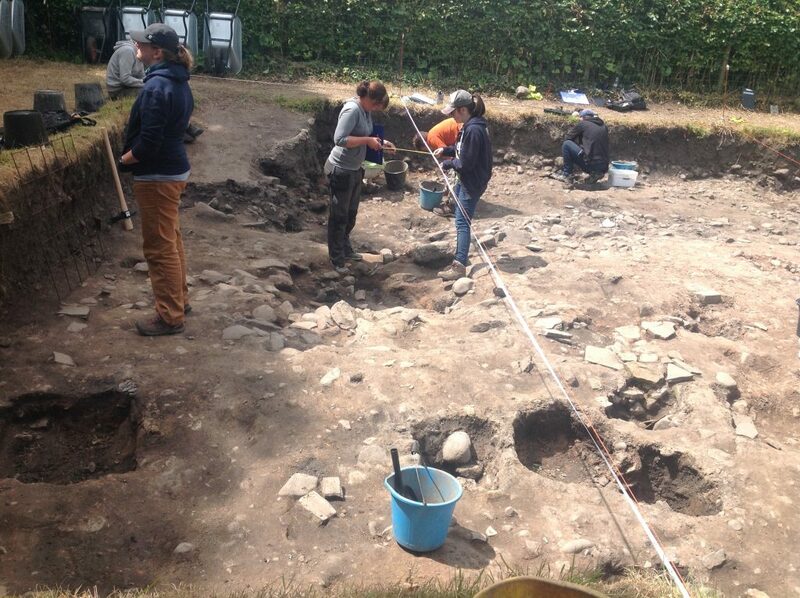 It is day 4 of this year’s excavation and the team is beginning to settle in and get to work. 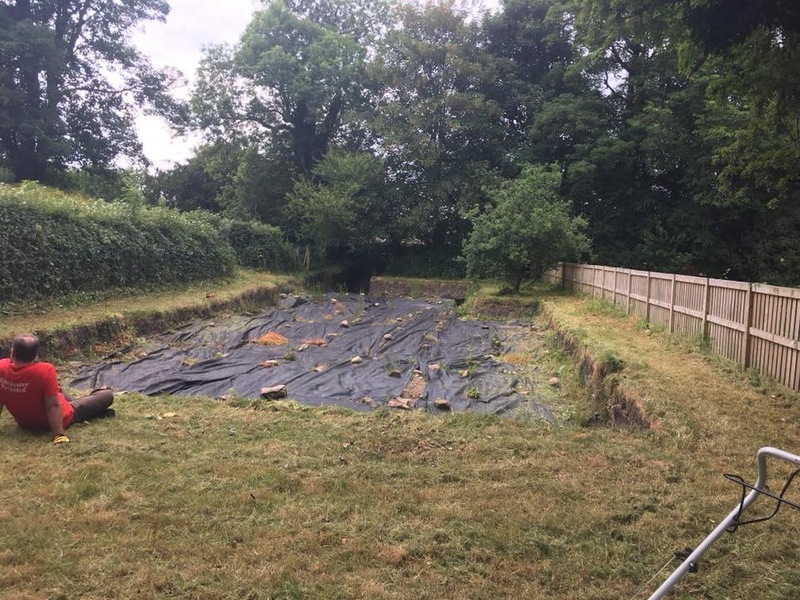 Before we could start digging this year we had to reclaim our trench from a year’s worth of shrubbery that had overgrown it. It took some hard work, but after a few close encounters with some stinging nettles the trench was clear and we could get to work. 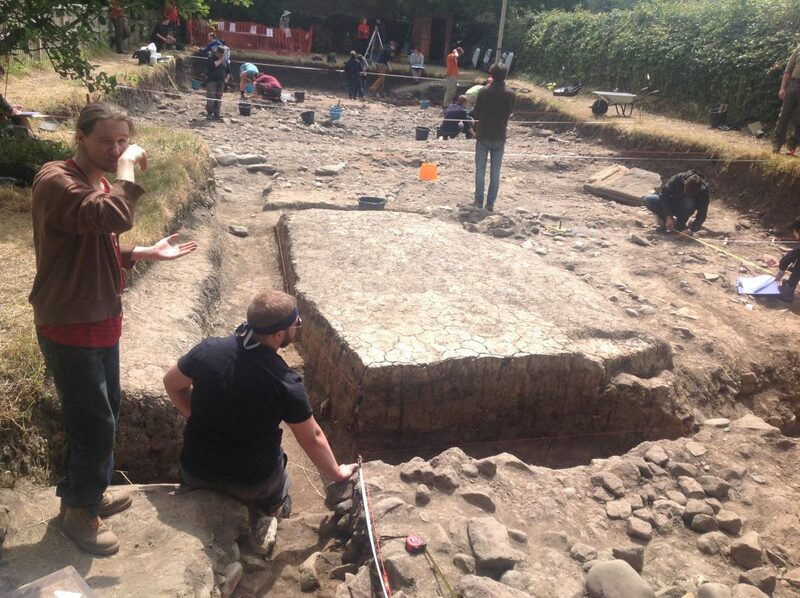 This year our excavations will be focusing on four main areas. Each of these areas will have a corresponding team: a collection of our international team from Australia, USA, Canada and England. The clay base of the ramparts, the wall and the ditch. 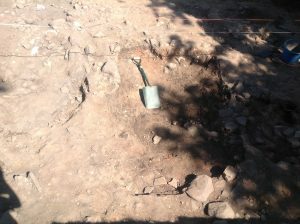 A possible workshop in the south of the trench. A possible building to the south of the guardhouse. 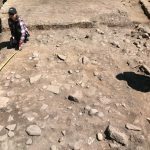 The other areas will be detailed in later posts, but this blog will discuss the clay base of the stone ramparts which are pictured above, beneath which we hope to find the remains of an earlier first century fort. So far we have managed to uncover the stratigraphy of this clay base (right). In this photo we can clearly see several different coloured layers of earth. 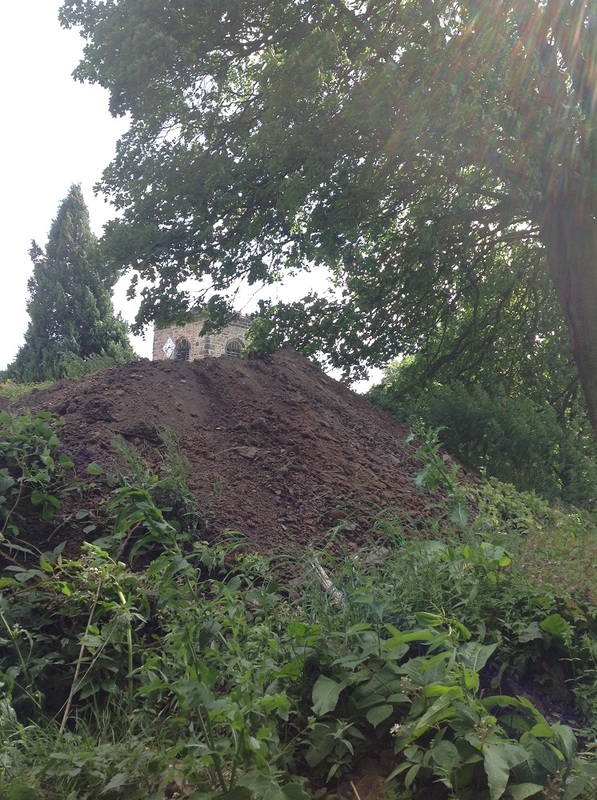 There is a large clay layer at the top which we believe was purposefully laid down as a foundation for a stone building above it. 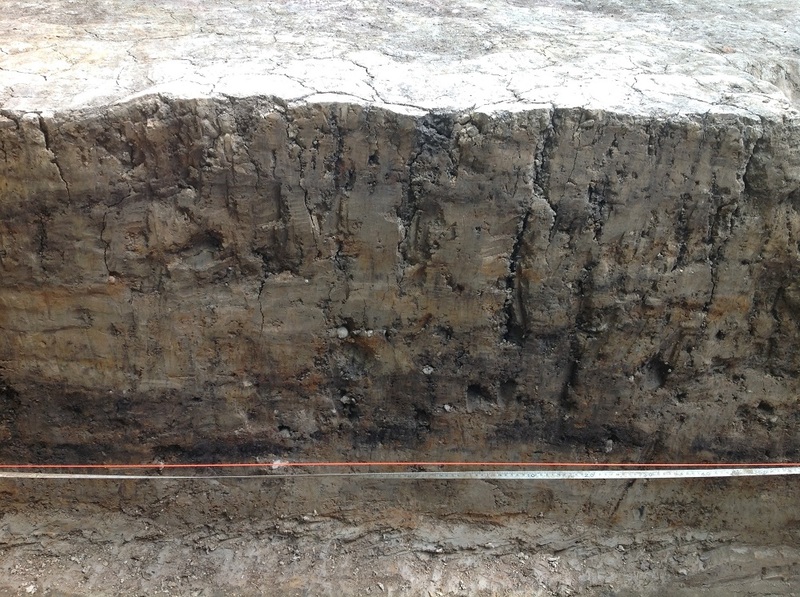 The darker black layer below this (near the orange string) is likely an organic layer, possibly caused by the cutting and laying down of wood to provide a base for the clay. 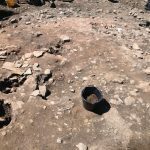 What’s exciting about this, is that below this layer we stand a chance of discovering the remains of the earlier first century wooden fort. Something we don’t think we will find anywhere else in our trench! 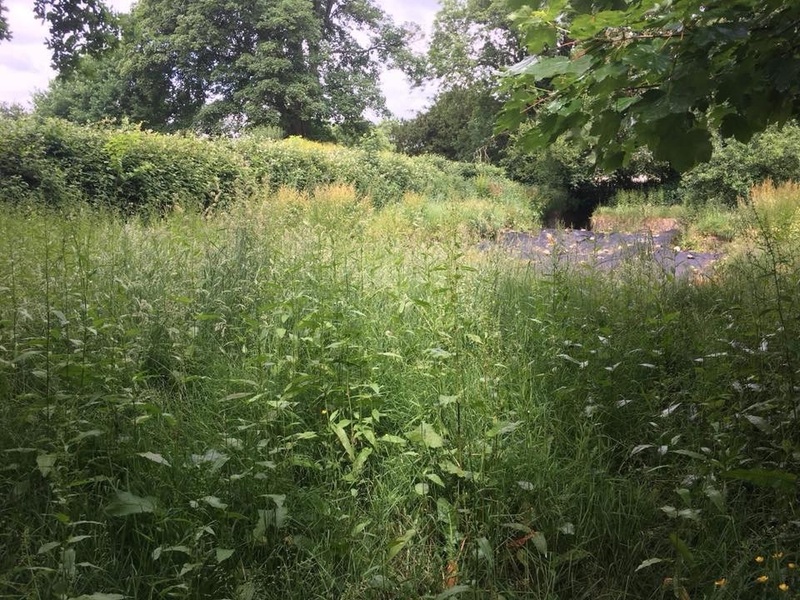 We were helped (or hindered) in this by making use of an earlier trench dug in 1907 by Thomas May who conducted several excavations on this site. 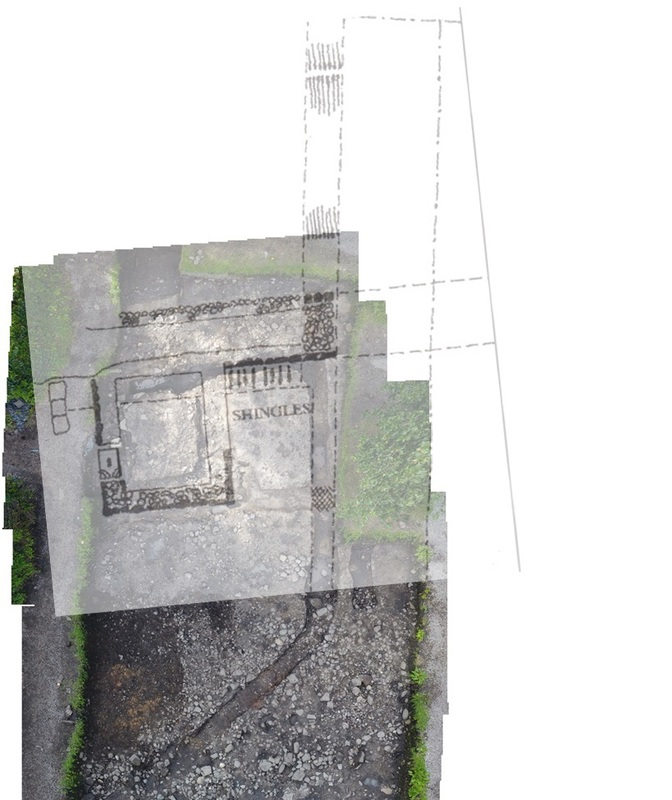 He left us several drawings and notebooks about this excavation (left), however some of them have gone missing over the last century, so we are discovering the archaeology of his excavation whilst we uncover the archaeology of the Roman forts on this site as well. By the end of these four weeks we hope to have all of this gone. 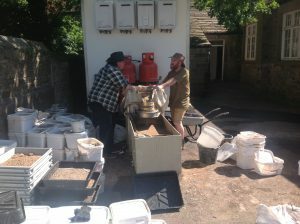 Duncan (one of our project directors) estimates we have about 8 tonnes of clay to move! That’s a bull elephant worth of clay to move! Luckily we’re well experienced moving large amounts of dirt and soil, this is how much we’ve collected on our spoil heap so far (right)! 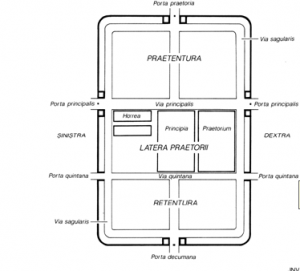 These spaces were permanent or semi-permanent bases for Roman troops. Most fort spaces occupy around 20 hectares. The Roman troops occupying these spaces were often auxiliary’s. They were not Roman citizens, but instead were drafted from other provinces within the Roman Empire (Historic England, 2011). Plan of the standard layout of an Auxiliary Fort. Including the Latin terms for the parts of the fort (Historic England 2011). The brief overview above gives you a bit of background information about the fort space itself and its internal layout, but, what about the people who occupied these spaces? We have already seen that auxiliary units most likely wouldn’t have been Roman citizens themselves, and the fact they travelled from other provinces outside England suggests that they may have had different ways of displaying their identities to the Pre-Roman and Roman Britons. 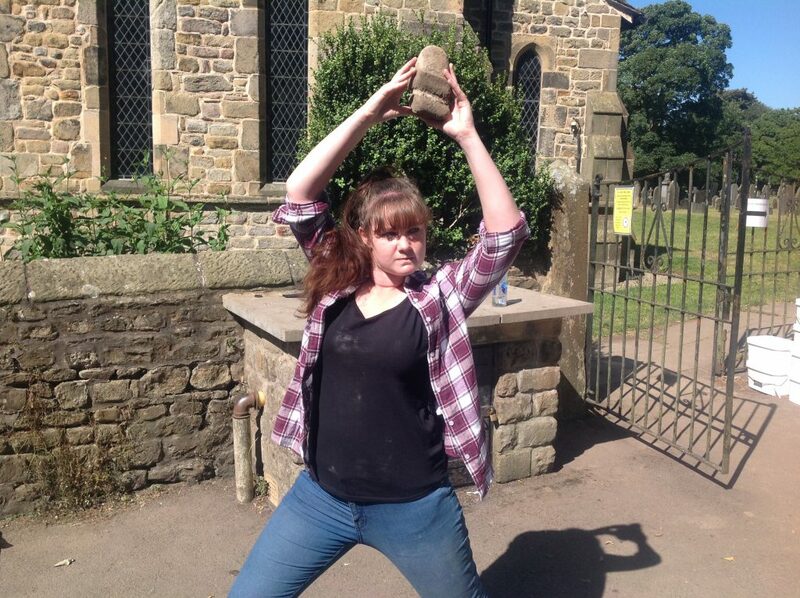 Below are a few artefacts found at Ribchester, with some of them coming from our excavations. 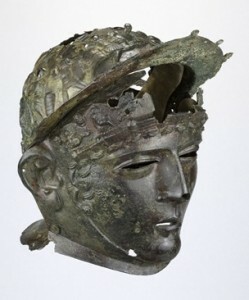 Any look at Roman military artefacts from Ribchester has to start with the famous Ribchester Helmet. The Ribchester Helmet was discovered in 1796 by children playing on the waste-ground behind their cottage. 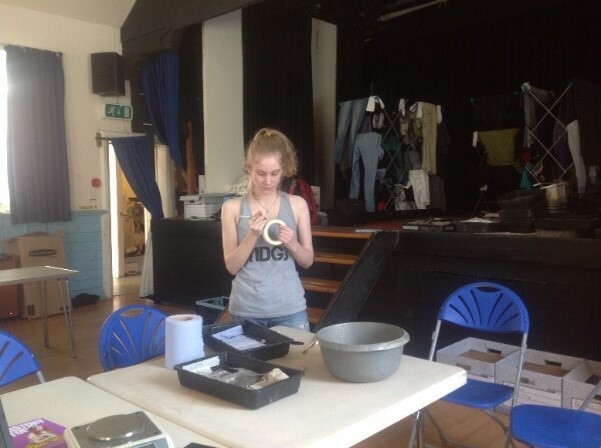 The next few artefact types are examples of the types of objects we have found during our excavations, and don’t necessarily represent the most common artefacts associated with the Roman military. A common find at fort sites, and something we have found a lot of during our excavations at Ribchester, are hobnails. Hobnails are associated with Roman shoes, and at some sites, they have even been discovered in the pattern of a shoe shape, with the leather having worn away. There has been research into the pattern of the hobnails and the types of shoe that they would have comprised! So far during our excavations at Ribchester we have found over 80 hobnails! 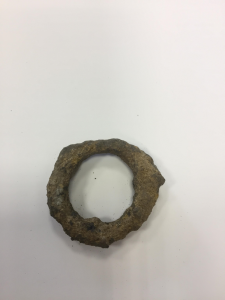 We have also found 1 example of a terret ring. Terret rings are metal loops, which would be part of a horse harness. When in use the reins would run from the drivers hand, through a terret ring, and attach to the horses bit to all the horse to be guided without becoming tangled up. We also have an example of a hipposandle, which would protect the hoof of a horse and was the predecessor of the horseshoe.